Well sir, I’ve looked with all the eyes I’ve got, and I wouldn’t trade the field behind my barn for every inch I’ve seen. So said Wendell Berry’s grandfather after his trip across Kentucky into Tennessee; one of the few trips he took very far from where he lived. Berry’s recollections about his grandfather begin his 2012 Jefferson Lecture: “It all turns on affection”. The printed copy I have of his speech still loiters in the bottom of my work bag, and I read fragments of it over again when I have some spare minutes on the bus. Berry still lives on his family property, as his ancestors before him have done. He tells stories of his grandfather, like when he would return from the market with nothing, having taken in the hard won tobacco crop, and been forced to sell at a price which left them “without a dime”. This was because of the way crop prices were controlled by a monopoly called the American Tobacco Company, which having eradicated market competitors could pay what it liked – an immense benefit for the profits of the corporation, and a source of pain for those who laboured to plough and grow and bring it to the market in the first place. He tells too of how his grandfather stuck on the land to repair and heal the damage he’d done when he ploughed a field on the lower part of a long slope and it was seriously eroded. Others may have left the damage behind, but his obligation of care for the land was deeply held. In some senses Berry felt that in an age when urbanization and industrialization were taking hold, his grandfather was ‘the wrong kind of man’. Still, there is a great deal to learn from their ability to be stickers on the land, and their knowledge of and affection for it. From these stories emerge other questions about the opposite of affection, of exploitation, the role of agribusiness, the demise of small landholders, and the ramifications of a loss of intimacy with the land and its people. In modern times we are largely all participants in this ‘absentee economy’ as Berry calls it; very often unconsciously. We may have comparatively little wealth, nor power, but we are more like the industrialist than the small landholder. This is so because we are largely removed or at least distant from the roots of much of what we consume. It is this distance, and a lack of imagination, that allows us not to see the suffering of a small landholder bankrupted at the mercy of the agricultural corporation. We may not see the small shifted to make way for the big, the vulnerable brushed away by the strong. We may not see the village downstream from the polluting factory. I do not see the seamstress who stitched my shirt, the boy harvesting my tea leaves, a long way from my home, and a long way from his. Or we may not even imagine the future, where the soil is degraded, the trees downed, the gullies eroded, the water cloudy. Berry describes how the tobacco corporation, in the case of his family, exerted an oppression that was entirely economic. It wasn’t political in that it wasn’t personal or intentional; it was simply oppression because the corporation was following its ordained purpose of making a profit. And their family and those around them were the side effects. Imagination is the idea on which much of this rests; it may even be what rescues us. By imagination Berry doesn’t mean make believe, or any suggestion of a lack of reality, but instead the idea of imagination is built around the sense of the root word – image – ‘to see’. Imagination, in its true sense, enables us to see what is real, even though it is not in front of us. Imagination, real imagination, enables sympathy. Sympathy enables affection, and affection, Berry argues, is the key to a neighbourly and conserving economy. He explains sustainability by two cycles – the cycle of nature and the cycle of culture. Nature being that of fertility and growth and the circle of life which sustains living things and the soil and the water. The cultural cycle is the passing of knowledge, between the young and the old. These things work in tandem to sustain our life on the earth. This speaks of a need for sustainable living that is based on connection, and in turn affection. Connection and affection is required in moral family and other relationships. And connection and affection are required for a sustaining and moral treatment of the land and landscape. Together, the passing of knowledge and the cycle of the natural world, are the means for survival and constant reinvigoration. Again, they are the keys to a neighbourly and conserving economy. It is the imagination and affection concepts that stay with me – the idea that if we nurture that imagination, and that imagination turns to affection and preservation, an economy might grow which does actually ‘see’ – see the future, see the far away labourer, farmer, factory worker, and see them as a neighbour. 1945: My mother (left), with her mother and young brother on their farm, north of Albany. That year they had to leave the farm and move to the city when my grandfather died. When I sit at our wooden table late at night and look into the kitchen I see 78 photos plastered across the tall cupboard doors – of our life, this year, from the past. There is a Claire surrounded by feathers at a festival. 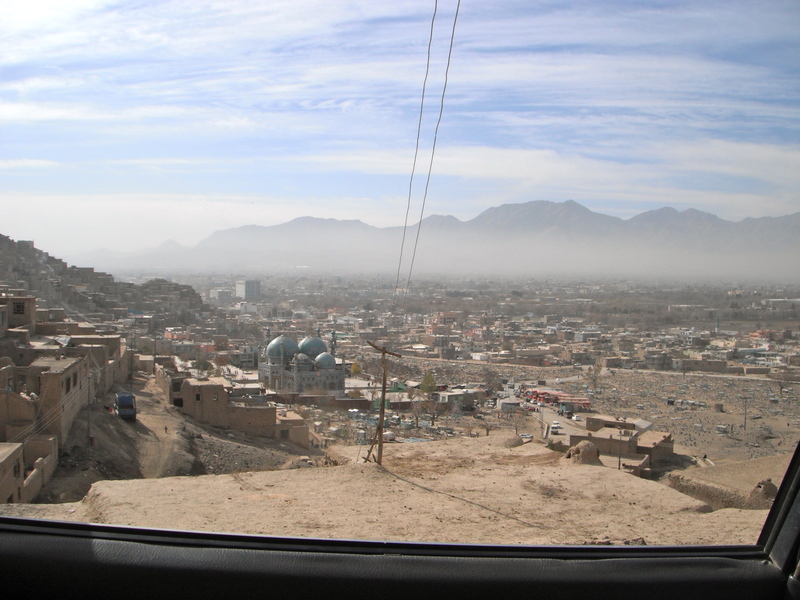 There is a wide view over Kabul and it’s staggering mountains, all dusty brown and grey and pale blue – a photo I took when visiting my dear friends. There’s Arthur the dog in a coloured bow-tie he wore for a special occasion, and Alice with sparklers at midnight in our friends’ backyard. There’s my mates and I with our guitars and drums, belting out some tunes from under the shed I repaired with left over pieces of corrugated iron. There is Louise holding a cake with candles alight, resting in a rock in the bush, Jane dressed in a homemade Miss Piggy costume, the dog and the duck sitting together on our lawn out the back, the mouse on an old German clock I bought from a very odd antique dealer. There is swimming in the ocean, and a campfire, and the faces of many of the people we love. What a strange and beautiful life we lead. These were some of my dreams, and whenever I can, when I’m scrambling along rocks with my girls looking across the moving sea, or yarning at tea time about why life is this way or that, or gazing at the orange clouds that parade in the western sky as the day is fading, I tell them this is what I dreamed of. I often think of tragedy, in places far away or lives close by – like a weight in a pack on my back, like a load on my shoulders, like a badge that ensures I never forget. But still, beauty. The dreams I had, the ever-present joys of the natural world and discovering it, of our animal friends, of finely crafted instruments, of treasured relationships, I carry those on my shoulders too, and my kitchen cupboard is a reminder. The storm surrounding Kevin Rudd and his admission about ETS negotiations within the Labour Party has drowned out the good sense he talked about refugees last night on Q & A. Asked a question about asylum seeker policy, Kevin’s reaction was to say “let’s put this into context …” And he did – 42 million people worldwide who are refugees, people fleeing violence and strife, with no home. Let’s repeat those – no home, 42 million. He called it what it is – a humanitarian emergency that we need to deal with as a global community, where we work together to protect and serve the members of our human family who are most vulnerable. If only we heard this more often from political leaders, our community attitude towards refugees and asylum seekers might not be so bogged down in fear and untruthfulness. The context, the real issues, and the human stories get lost in the barrage of insults about queue jumpers and border protection and let’s face it, plain old selfishness and xenophobia. As is often the case, it is those who are most vulnerable who very often get hurt the most, and in Australia, we are a long way from a mature public approach to migration and people movement. I wonder if we’ll ever get there? Others following the former PM’s lead on this one would help.